The concept of games expanding on their own endings isn’t anything new in the slightest. Be they through epilogues, sequels, or DLC, the number times a game has thrown out a “THE END” screen only to follow it up at a later point is far higher than I’d care to count. So, with that in mind, you might think that Corpse Party: Book of Shadows is just that; simply another continuation of a previous “THE END”. And it is… But it also isn’t. For all of the times I’ve seen games pick their own story up after previously ending it, I don’t think that I’ve ever seen a game focus on the endings that weren’t supposed to happen. The ones that, after encountering them, you continue from the last save while making sure to avoid them a second time. But that’s precisely where this game thrives. 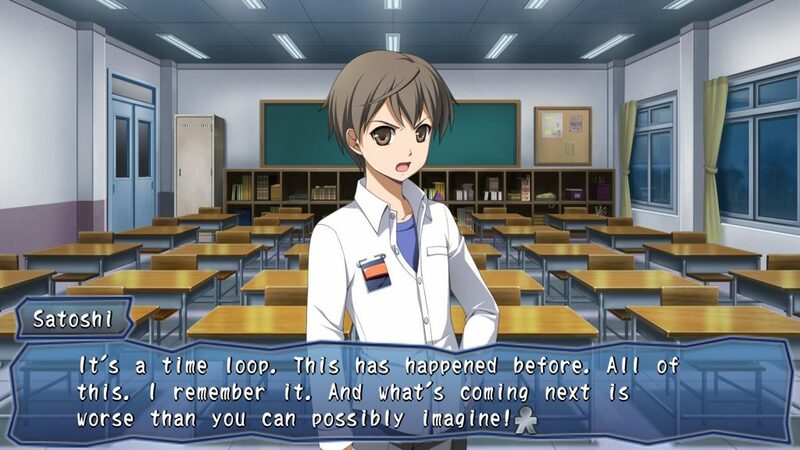 It knows that, when playing through the original Corpse Party, you probably made a handful of mistakes that lead to people’s untimely demise, and it’s here to make you feel even worse about those mistakes with a frightening amount of success. Corpse Party spoiler warning, by the way! At least you tried, Satoshi. At least you tried. This is usually the part of the review where I give some background information about the game’s story But I can’t really do that with Book of Shadows. Not in the way I normally do, anyway. And that’s simply because there isn’t a “traditional story” to talk about. Despite technically being a sequel to Corpse Party, Book of Shadows doesn’t do much in terms of actual story progression until the very end. Instead, it splits itself up into eight unrelated chapters where it sets its narrative sites on both fleshing out (no pun intended) certain characters’ stories, and exploring a few of the game’s Wrong Ends. 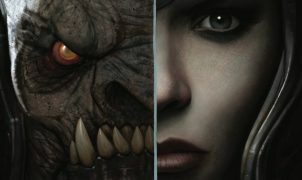 Acting as prequel, midquel (yes, that’s a real word), and sequel, most of BoS’ “world-building” chapters are dedicated to casting the limelight a selection of the game’s characters (most of whom originally played minor roles) in order to provide the players with additional context on their backgrounds before, during, and, in the case of the last chapter, after the events of the original Corpse Party. 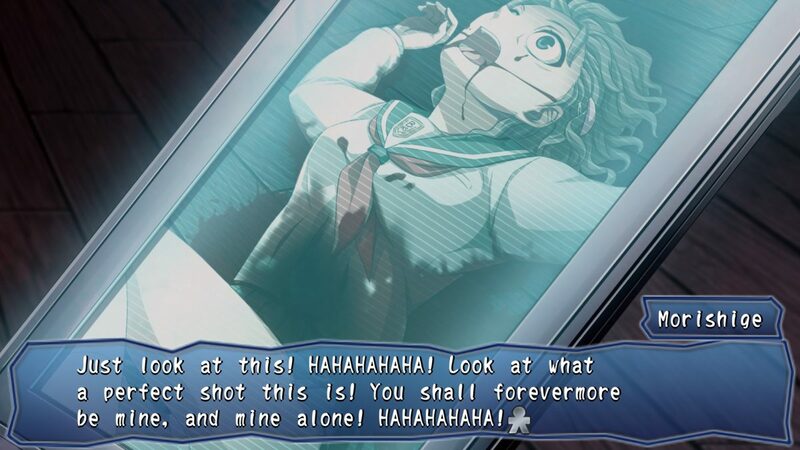 Unsurprisingly, most of these chapters end up coming across as bittersweet – especially Sayaka’s, whose story begins with her reminiscing about past events as she’s literally being dragged to her death – but, due to the intensely dark nature of the Corpse Party series, the sadness of knowing what’s going to happen to each of these characters only serves to enhance the story overall – or, in Chapter 8’s case, build up suspense for Corpse Party: Blood Covered. Book of Shadows offers repeated lessons in futility and despair. The rest of BoS’ stories are continuations of the original Corpse Party’s Wrong Ends. 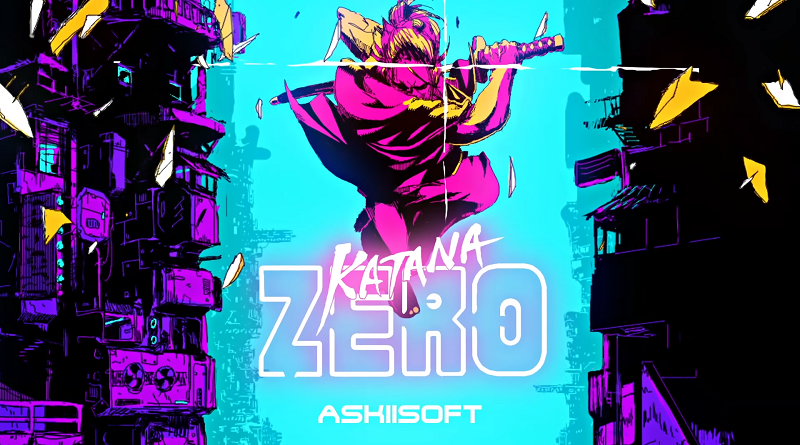 More specifically, all but one of them are continuations of Wrong End 2 ★4 – where time rewinds itself to the beginning of the game with only Satoshi remembering what happened, trying to stop it, and failing. And, as you might expect, things don’t go any better for the crew this time around. Already having once proven itself to be one of the most sobering and grotesque horror series around, BoS cranks the intensity up to 11 for each of these hapless heroes’ second venture through Heavenly Host Elementary – and I don’t say that lightly. My journey through BoS has presented me with some of the most disgusting and soul-crushing scenarios that I’ve seen in a video game in a long, long time (and I’m no stranger to horror). Because of that I’ll warn you right now that if you aren’t mentally prepared for what’s awaiting you then you might not be able to handle what this game throws at you. It’s… well, intense. But I suppose that, without that intensity, it just wouldn’t be a Corpse Party game – and in that regard I applaud the developer for sticking to their guns (or should that be sticking to their guts?). 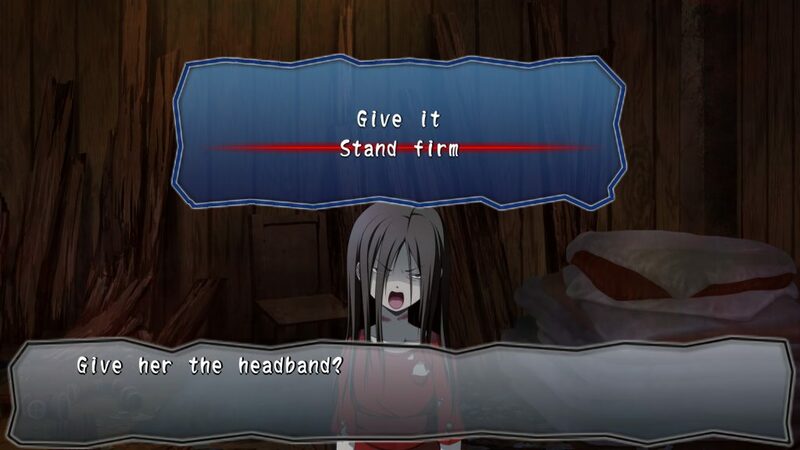 EVERY decision is a bad one when Sachiko’s involved! 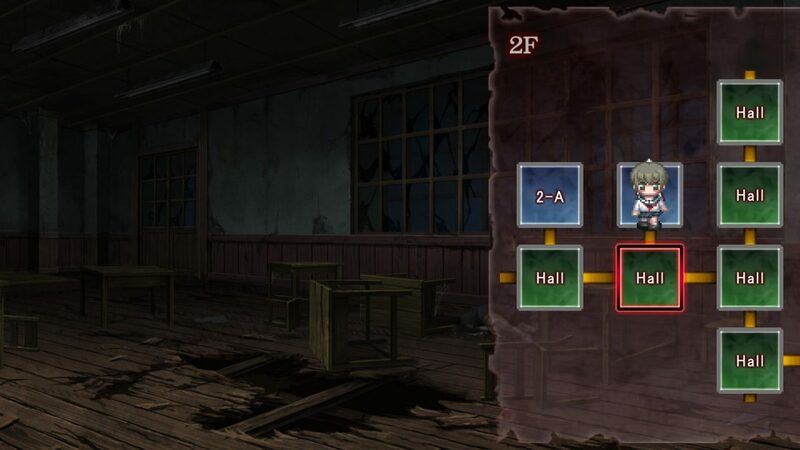 Much like its mode of storytelling, Corpse Party: Book of Shadows also deviates from its predecessor (and eventual successors) in terms of gameplay. Ditching the series’ traditional exploratory survival/horror gameplay, BoS largely presents itself as a Visual Novel with point-and-click elements sprinkled in. In true VN fashion, this means a good chunk of the game takes place through lengthy dialogue segments, with the player experiencing the events through the point of view of whichever protagonist they might be in control of. No VN, however, would be complete without branching paths, and BoS has your back covered on that as well. Though somewhat sporadic, the choices that players make throughout each chapter are incredibly important to the overall outcome and, more often than not, literally mean the difference between living to press on or seeing one of the game’s many Wrong Ends. Although, considering that Wrong Ends add a healthy dose of extra content to each chapter’s story (which are all on the shorter side), frequent encounters with death aren’t necessarily a bad thing. In between the game’s many VN segments is also decent amount of exploration for players to conduct on their own. 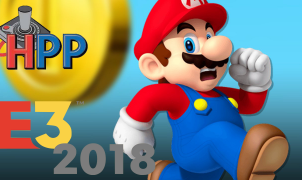 As I’ve already said, however, it doesn’t work in the same way that its older and younger mainline siblings do, adopting a unique first-person point-and-click style instead. 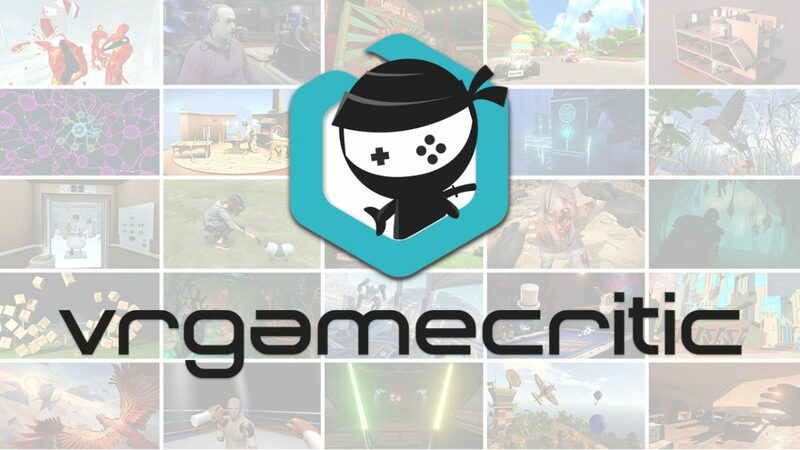 Players are able to use the mouse (or controller) to examine their surroundings and interact with objects and, rather than manually having their character walk around, move from room to room via a school map. While much less threatening to the player in terms of running into a Wrong End than the VN segments, the player isn’t entirely risk-free while exploring. Examining certain objects and triggering certain events fills up their character’s “Darkening Meter” – a measurement of how well they’re holding on to their humanity. Typically, Darkening isn’t a big deal – I don’t know that I ever reached 100% Darkening without doing so on purpose – but it’s something to watch out for as there’s no way to decrease it. And, imposing or not, it makes a neat addition to the game, even if only from the point of player immersion. Be sure to mind your step. Normally, I’d be the first person to tell you that I don’t really dig point-and-clicks. I don’t dislike them or anything – on the contrary, there are some really cool ones out there – they’ve just never really been my thing. But there was something about the way that BoS presented its exploration segments that I didn’t mind. There was typically just enough of a challenge that you had to think, but never so much that it overshadowed its narrative-heavy focus – a balance which I ended up appreciating. Unfortunately, it wasn’t perfect. Despite its nice approach to the point-and-click genre, these segments seemed to contain a good deal of filler. Heavenly Host isn’t huge by any means, but it still takes a little while to explore. And, while every chapter had certain portions of the school cut off from exploration, there were times when there was a bit too much scenery and not enough to do in it – especially when it came to the game’s segmented hallways. I get that having event-less rooms builds up suspense, but you can only walk through so many empty classrooms and hallways before it starts to get dull. This isn’t even the most graphic part of this chapter. Book of Shadows’ story is creepy enough on its own, but its fright factor wouldn’t be anywhere near where it ultimately ends up without its killer (hah!) audio and visual components. Not only does BoS feature a great lineup of ambient and disturbing tunes to jam to (with a few oddly upbeat ones thrown in for good measure), but its cast of voice actors absolutely knocked it out of the park. I may not know Japanese, but I don’t need to understand the words that someone’s saying in order to understand the emotions that they’re conveying – and man, did those emotions ever come across loud and clear. And this was only further enhanced by the game’s use of 3D audio which, as cheesy as it sounds, really does a good job of helping bring the player into the middle of the action (although I don’t think that Heavenly Host is somewhere that I’d actually want to be). And then, there’s the artwork. It’s dark. It’s gory. It’s frequent. And, when combined with the overly detailed writing and emotional voice acting, it completes the unholy trinity of stomach-churning darkness. But that’s what makes it so memorable. While this game may have some of the most unsightly CGs that I’ve seen in a long time (in terms of depiction, the actual art quality is great), there’s a lot of merit to a series that knows what it wants and goes for it – regardless where that drive takes them. And, while BoS’ drive took it someplace admittedly niche, there’s no denying that it has plenty to offer to the crowd that it’s catering to. Consisting mostly of lore building of already dead characters and continuations of assumedly non-canonical Wrong Ends, this game does feel a tad bit supplemental. But that doesn’t mean that it isn’t a good game. 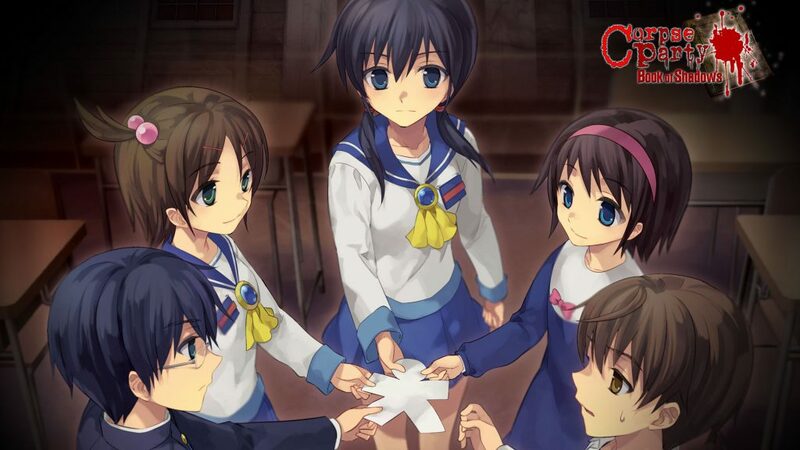 Despite any misgivings, Corpse Party: Book of Shadows still adds up to an enjoyable, gruesomely detailed time for both Corpse Party and horror genre fans alike (although you might be a bit confused if this is your first game), and is definitely worth checking out. Just mind your stomach before you do! Full disclosure: This review is based on a copy of Corpse Party: Book of Shadows given to Hey Poor Player by the publisher.